Our work is mainly outreach in people’s homes or where they are staying. We provide holistic health interventions for individuals and families which help and engage people to use mainstream services. Key parts of our work are TB screening and education about TB and mental health interventions by qualified practitioners. 14 Piccadilly, Bradford BD1 3LS. 2 female and 5 male bed spaces available for those with ‘no recourse to public funds. Bradford Nightstop provides free emergency accommodation for young homeless people aged 16-25 in the homes of trained volunteers or in a room at a local hostel. Our accommodation is for one night at a time. Young People are provided with an evening meal and the chance of a bath or a shower. Destitution Drop-in. A welcoming and safe space for asylum seekers to get advice, use computers and meet others. Every Tuesday at the Millside Centre, 131 Grattan Road, Bradford, BD1 2HS from 10:00 – 14:00. Email: SBaka@redcross.org.uk for more information (Monday – Thursday) or contact the office on 0113 2015240 and ask to speak to Refugee Support on Fridays. The ADVICE SERVICE provides advice and assistance to refugees and asylum seekers who reside in the Bradford District on a number of issues such as housing, employment, health and wellbeing, integration and welfare benefits. Course and mentor support to improve the English needed to access the job market, support with CV creation, applications, interview practice and help to access other training opportunities. Promotes the general welfare of the Syrian community in the areas of education, health, law & order and leisure; helps to improve access to facilities and services; raises awareness of the needs of the Syrian community with providers, works for equality and justice for all, to achieve a cohesive and caring society. New migrants who have permission to work in the UK who live in West or North Yorkshire. • Thursday Drop-In. Held from 6 to 7.30pm at Bradford Deaf Centre, 25 Hallfield Road, Bradford BD1 3RP. A good meal is provided and donated clothing and goods are often available. Members are signposted to relevant agencies and other sources of support. On the first Thursday of the month there is an Open Meeting with interpreters to plan future activities, air views and disseminate information. There is no distinction between ‘client’ and volunteer, between continuing and ‘failed’ asylum seekers and successful refugees – all are seen as members. • Women’s Club. For women and their children. Held at Bradford Deaf Centre, 25 Hallfield Road, Bradford BD1 3RP from 1-4pm every Thursday. The Club provides opportunities for women to socialise as well as arts and other activities. Playworkers provide activities on some weeks for children. There are also periodic visits from BafR’s befriending co-ordinator; a representative from McKenzie Friends (see above, under BEACON); Horton Housing’s HOSTS project (see below) and other services. • Special Events including an August Bank Holiday day trip to the seaside. FREE conversational ENGLISH practise with English speakers 1pm – 2.30pm every Thursday during term time at the, St Clements Church, Barkerend Road, BD3 9DF. Parents with pre-school children welcome. Our English club has been running successfully since March 2010, seeing many people improving their English, and some even speaking English for the first time! All welcome. – Everyday English Club – Every Thursday during term time, 1pm-2.30pm – Open to all levels, everyone welcome – a free English Conversation Club with English Speakers. Parents with pre-school children welcome. – English My Way – Every Friday 10am-12pm – Aimed at pre-entry level learners, women only, free – A fresh approach to learning ESOL (English as a Second Language). Women with pre-school children welcome. A range of activities from textile work, felt making, paper crafts, woodcrafts & creative writing.! Lunch is available on Fridays from 12-00 noon to 1-00pm, for anyone who has been to a class at Hope House during the week. Sewing, Knitting Bring your own material and wool. There will be someone there to help. Friday: 10-00am to 12-00 noon. Kirkgate Centre (opposite Town Hall), 39a Kirkgate, Shipley, BD18 3EH. and a women’s Knitting Group Wednesday 9.30am. *Advocacy, support & drop-in service 3 times a week at Bevan House primary care centre (see above) for women, including homeless, asylum seekers and refugees* Referrals via Bevan House. Open 8am – 8pm 7 days/week. Anyone can just turn up to see a GP or a nurse, whether a patient of the practice or not. No appointments needed. 4 Butler St West (off Otley New Rd) BD3 0BS – 800m from City Centre. 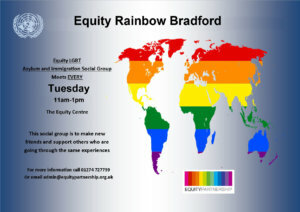 ‘Our’ is a Bradford based community service working with people living with HIV. The focus is to offer a quality service to all people living with HIV or AIDS in the Bradford Metropolitan District. Sharing Voices promotes self-help and mutual support, through community development. Groups are a large part of helping members to develop collective action. Participation in activities of their own choice including fitness, music and faith groups as well as activities around art and which are gender specific. 99 Maningham Lane Bradford BD1 3BN. Solace is a charity which provides individual counselling and pain/stress management to asylum seekers and refugees in the Yorkshire region. Solace in Bradford is based at Bradford Action for Refugees, where the service is available on Monday afternoon and all day on Wednesday. We plan to run a Solace Stress Management Group in the Spring of 2015. Referrals for our Bradford service should be made to Solace’s Leeds office: Suite 2, Bank House, 150 Roundhay Road, Leeds LS8 5LJ. We see those who are homeless, at risk of homelessness or living in unsecure tenure and are experiencing mental health difficulties and Asylum seekers in need of signposting and/or experiencing mental health difficulties. We accept self-referrals, referrals from voluntary organisations and referrals from GP practices. A service offering support 24 hours a day, seven days a week to people of all ages living in Bradford, Airedale, Wharfedale or Craven experiencing a mental health crisis. You can register for MyWellbeing College online or over the phone and don’t have to go through your GP. The only time they will be contacted is when you have finished your course to let them know, or if we are worried about you or others around you. Bradford Law Centre offers a free legal advice service to people in the Metropolitan District of Bradford, which includes Shipley and Keighley. We also campaign on important social policy issues, and influence law policy and practice in order to combat social exclusion. Bradford Law Centre is also part of the Bradford Community Advice Network, which offers advice in additional areas of law. For more information visit www.bradfordcan.org.uk. We provide a Specialist Immigration Service and have wide experience of dealing with all aspects of Immigration Law. This includes: Asylum and Human Rights, Family Reunion and Migration, Visa Applications, European Union Rights, Point-based System Applications, Enforcement and Deportation, Citizenship Applications. Office 4, 125A Fitzwilliam Street, Huddersfield, HD1 5PS. Providing affordable immigration legal advice and representation covering a wide range of immigration and asylum matters. We are a Community Interest Company and we operate on a “not for profit” basis. The fees we charge are to cover the running costs of representing your case. Any profits that are made will be used to provide pro-bono work for those least able to pay. The Manuel Bravo Project is a new charitable organisation which is starting to help asylum seekers who are unable to find adequate legal representation. The Project is volunteer-based with barristers, solicitors, law students and lay volunteers giving their time to assist people. Any immigration advice is provided by the solicitor or barrister as an individual rather than from the Project. Following a referral, the papers are reviewed by an immigration specialist. Clients are invited to attend an advice session – usually a Tuesday evening. Teams of qualified lawyers from Leeds law firms then help the client to prepare their case for hearing on a pro bono (free) basis under the supervision and guidance of specialist immigration barristers. Volunteers ensure the smooth running of the sessions, carry out country information research, undertake administrative tasks at sessions and support the client through the process. We do not currently have resources to represent clients at the hearing itself. The Manuel Bravo Project. Cordelia House, 45 Westfield Rd, Leeds, LS3 1DG. Drop-in Mondays and Tuesdays 11.00 – 1pm; other times by appointment. Help with immigration advice, welfare, housing and education. Kate Sutcliffe is able to receive and pass on donations of furniture, bedding, curtains, utensils but not white goods. Are you an asylum seeker, a refugee? Do you need household items such as: kitchen items, clothes, children wear? Come to BIASAN Storage at: Rawson Road, (immediately next door to Blood Doning Centre) BD1 3SH. • Open for members to take items of clothing and household goods every Thursday 11.30-1 and 3-4. Asylum Matters is an advocacy and campaigns project, hosted by City of Sanctuary, that works in partnership locally and nationally to improve the lives of refugees and people seeking asylum through social and political change. It is incorporating and building on the work of the Still Human Still Here coalition and the Regional Asylum Activism (RAA) Project. The mandate of Asylum Matters is to secure the goals identified at the Sanctuary Summit in 2014 which have been endorsed by more than 320 organisations as part of the Birmingham Declaration. The representative body for Bradford’s refugee communities. City of Sanctuary is a national movement to build a culture of hospitality for people seeking sanctuary in the UK. Its goal is to create a network of towns and cities throughout the UK which are proud to be places of safety, and which include people seeking sanctuary fully in the life of their communities. A ‘City of Sanctuary’ is a place where a broad range of local organizations, community groups and faith communities, as well as local government, are publicly committed to welcoming and including people seeking sanctuary. Amongst other things, in Bradford we run regular events, engage with the Council and its partners to improve services for those seeking sanctuary, work with local media to get accurate and positive coverage of asylum issues. CRC is a community-led peace and conflict resolution-training centre. It is based in Bradford to serve all communities of Bradford District, mainly the Refugee Communities, but also, through Internet, all community’s victims of conflict around the world. In partnership with Bradford Council, Bradford and Airedale PCT, Education Bradford and Manningham Housing Association, Horton Housing delivers support services in this successful humanitarian programme in Bradford on behalf of the UK Border Agency and European Union. Bevan House Primary Care Centre, 14 Piccadilly, Bradford BD1 3LS. Together Women is a charity offering a gender-specific service to women. We have locations in Bradford and Leeds which both cater for refugees and all of our services are free of charge. Clients can be referred in or call the number to refer themselves. Opening Hours: Mon-Thurs 9am – 5pm; Fri 9am – 4:30pm. Opportunities for asylum seekers & refugees. The Centre provides a range of activities and resources, including child-care, adult education, community support, advice and guidance covering such areas as education, employment, adapting to UK culture, citizenship and immigration. St Augustine’s Community Support has been set up to provide help for asylum seekers, refugees, EU migrants and to all those resident in the local community who require assistance. Citizens’ Advice Bureau, Central Hall, Alice Street, Keighley BD21 3JD. Drop-in service Monday, Tuesday, Wednesday 9.30 am to 1.30 pm. Bradford Law Centre Central Hall, Alice Street, Keighley BD21 3JD. Free legal advice and representation. Alternate Thursdays. Tel. 01274 306617 to make an appointment. Drop in: free coffee, cake and play. Mothers with babies and toddlers. Fridays 10.00 – 12.00 noon. English classes Mixed (men and women): Tuesday 1 – 2.30 pm. Support for Asylum Seekers (including food parcels, signposting, conversation, refreshments) 10am-12pm. Open access – no referral needed. Free meal, friendship & support. This website was developed by Touchstone as part of the Migrant Access Project Plus (MAP+) and was commissioned by Leeds City Council. The website aims to provide information to people moving to Leeds, about services, support and amenities available in the city. You can translate this website into different languages using the icon at the bottom right of each page. If you need this website in a different language, you can translate each page by copying and pasting the URL into Google Translate. We have used Google Translate because it means we can offer some translation in a wide range of community languages. We know that Google Translate is not always 100% accurate but we hope that it is still helpful. However, if you find something that translates incorrectly or offensively, please get in touch with us using the Leave Feedback option. The aim of our charity is to work with asylum seekers in detention/removal centres and prisons to secure bail in appropriate circumstances and to provide support before and after release. We have no paid workers: all work is carried out by volunteers.